As explained in the previous articles, Openstack is a complete set of project which consists of several components. These are inter-related components that control the hardware pools of processing, storage and networking resources throughout a data center. Refer the link to know more about the Openstack components. To deploy the Openstack cloud environment for your organization, we need to install these components on single server as standalone / Single Node configuration or on interconnected servers as multi-node configuration. To start, we will explain you how to install these components all together on a single server as Standalone / Single Node configuration which will make you to understand the basics. we will cover the multi-node configuration in the upcoming articles. 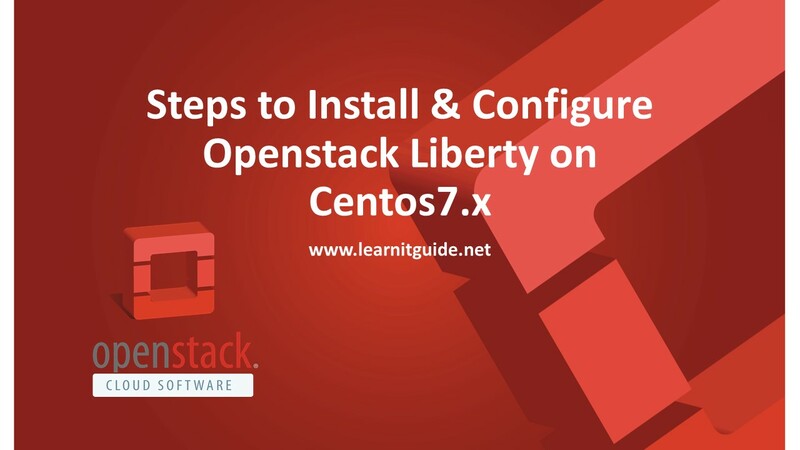 This post explains you, how to setup the Openstack Packages on CentOS7/RHEL7 through RDO repository. Here we use the Latest Openstack release "LIBERTY" Which was released on Oct, 2015. 3. Virtualization Extenstions should be enabled. Update the Packages and Install the RDO repo using the below command. RDO stands for RPM Distribution of Openstack. RDO is community of users and free distribution of Redhat linux packages(CentOS, Fedora and Redhat Enterprise Linux). Refer the following link for more information https://www.rdoproject.org/rdo/faq/. Step 2: Install the Openstack Installer "Packstack"
Packstack is a utility that uses Puppet modules to deploy various parts of OpenStack on multiple pre-installed servers over SSH automatically. Packstack can be used to install each OpenStack service on separate servers, an ''allinone'' server, or any combination of these. There are three ways that Packstack can be run. The third option allows the user to generate a default answer file, edit the default options, and finally run Packstack a second time using this answer file. This is the easiest way to run Packstack. Edit the answer.txt file to set the needed parameters as per the requirement. We can choose, which services are need to be installed using this answer file. Save and Exit from the answer file. Execute the below command to start the Openstack installation. Once the Installation process is completed, See the last few lines from the output of the above command, which will show you the dashboard link and your login credentials will be stored in the file "keystonerc_admin" under your home directory. We can login to the Openstack web interface dashboard to create and manage the Openstack Cloud environment. We have done the Openstack installation successfully, we will explain you how to work with the dashboard and how to create, manage and delete the Instance in the next articles.